/ Society / Ram Janambhoomi 2.0, Fascism on rise again. Ram Janambhoomi 2.0, Fascism on rise again. 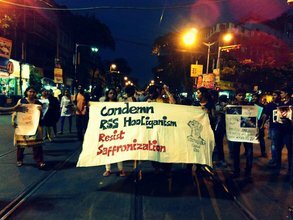 On the evening of 2nd December, RSS (Rashtriya Swayamsevak Sangh) and Bajrang Dal goons brutally attacked student and youth activists from PDSF (Progressive Democratic Students Federation) and KNS (Krantikari Naujawan Sabha) peacefully protesting the presence of RSS chief Mohan Bhagwat in Kolkata, near Science city. Beaten with sticks, sharp weapons, hit directly on the heads, molested and abused, three of them had to be hospitalized and several others are still recovering from serious injuries. Police stood as a mute witness. We know that this kind of hooliganism from the fascist lumpen brigade is nothing new and is in fact what defines their brand of ‘tolerance’. However, as protesters who shouted ‘Bhagwat Go Back’ were attacked by fascist forces at the gates of the venue where he was speaking, what was brewing inside is even more sinister. Bhagwat came into the city with an expressed communal agenda, ahead of the West Bengal assembly elections early next year and more immediately to stoke communal frenzy as another 6th December approaches. The RSS was commemorating the ‘martyrdom’ of kar-sevaks Ram and Sharad Kothari who had died during L.K. Advani-led rath-yatra during the Ram Mandir ‘movement’ in 1990. Bhagawat has been quoted as saying in the meeting, “The grand goal (of building the Ram Janmbhoomi Mandir) may be realized in our own lifetime. May be we can see it with our own eyes…None can say when and how the temple will be constructed, but we need to be prepared and ready”. While Bhagwat readied his forces beyond the gates, democratic and revolutionary youth rallied peacefully outside. The brutal beating up of students and youths protesting the increasing communalization of our society being engineered by the Sangh Parivar is only a minor clue to exactly how Bhagwat expects and plans to see the ‘grand goal’ being fulfilled in his lifetime. The heightened rate of killings and persecution of members of minority communities and dissenting voices across the country is not news to anybody anymore. We also know this compounding of everyday discrimination is faced most brutally by various oppressed sections including Dalits and other backward castes, women, religious minorities-particularly Muslims, and ethnic and other marginalized identities. The normalization of this fascist violence is precisely the buildup that Bhagwat desires for his stated dream of the building of the Ram Janmbhoomi temple, which is now well established to be little more than an euphemism for the establishment of complete dominance of militant Hindutva politics over the Indian socio-political scene. The Sangh Parivar has been quick on the move across the country, fanning communal tensions with active State support by the BJP government at the center and in various states. Even in places such as West Bengal with a non-BJP state government, the Sangh has managed to flourish rapidly feeding on the insecurities of the majority Hindu community (as also attacking those seen to be dissenting within these communities), threat and the use of muscle power and also basing itself on the generalized communal commonsense of even so-called opposition parliamentary parties. The number of RSS shakhas in the state has increased from 650 in 2013 to being projected as reaching 1200 by next year. Communal clashes have been on the rise in the state as in the country, a recent flare-up being witnessed in Medinipur district of the state. This fascist movement is at the current juncture also skillfully helping divert the anger of the masses faced with the intensification of the neo-liberal assault from pro-corporate changes in labour laws, decreasing quality of employment and exploitation of cheap labour in the name of ‘Make-in-India’, rapid disinvestment and exploitation drive of natural resources, hike in and deregulation of prices of various essential goods and services such as life-saving drugs, transport and so on. With Legislative Assembly elections coming up in West Bengal in 2016, the Sangh Parivar’s plans for the state are abundantly clear and already afoot. In such a context, Bhagwat’s visit to Kolkata in relation to the Ram Janmabhoomi Movement and his emphasis on another drive to establish the same could not and ought not to have gone unchallenged. The blows on the bodies of our comrades yesterday are grave, yet nothing before the blows being dealt out to the body of our social fabric and they only make out skin thicker, our resolve to unitedly fight stronger, our anger deeper. 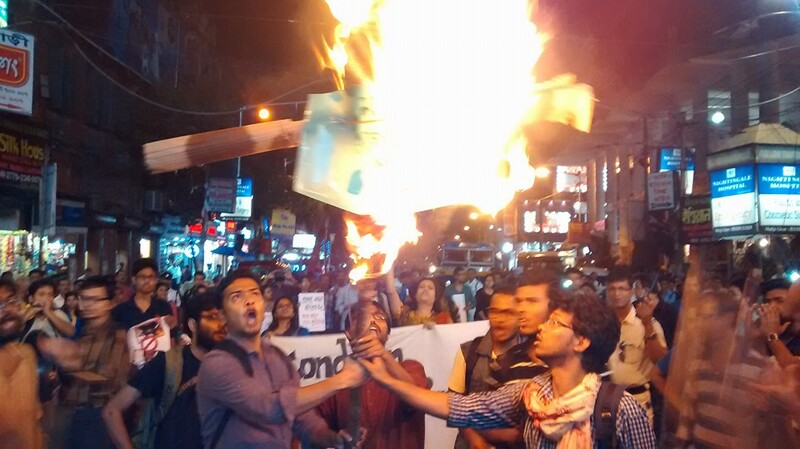 Today on 3rd December hundreds of students and youth unitedly rallied in Kolkata against yesterday’s attacks with a resolve to resist the growing fascist attacks, but a broader united unrelenting resistance is undoubtedly required. The rath-yatra of 1990 whose ‘martyrs’ Bhagwat was commemorating was prelude to the horror of communal riots that visited the country in the wake of the demolition of the Babri Masjid on 6th December 1992, post which, over 2000 people, mostly Muslims, were killed across the country. Today as another 6th December approaches, we must ask ourselves, what is this intensifying fascist brutality a prelude to, and must prepare ourselves unitedly to fight back the onslaught in every town, city and village where the Sangh Parivar goes.